Do you need a lactation boost? Many moms are concerned that they're not making enough milk. There are many factors that play into decreased output, HERE is a post I wrote about milk production with helpful links that provide evidence based answers. If you've seen a drop and are struggling with milk production, there are natural options that can help. 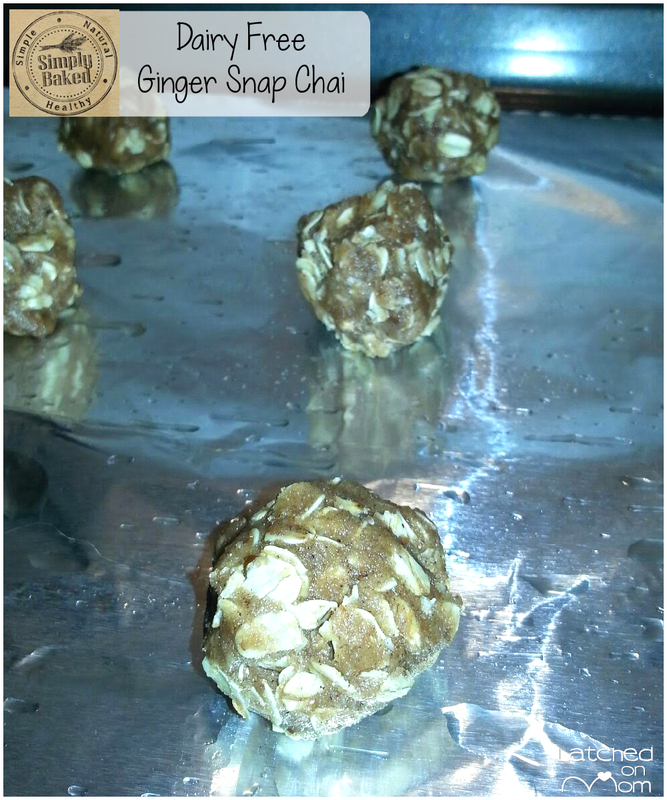 One of the most common galactagogues you'll see mentioned is lactation cookies. I was so happy when I came across Simply Baked Co. They offer a variety of flavors of Lactation Cookie Kits and premade Lactation Cookies, Boobie Bites, Lactation Cookie Cups as well as toddler Teething Biscuits and Daddy Cookies! Kristen Scott is the WAHM behind Simply Baked Co., which is based out of Denver Colorado. Simply Baked was founded in November of 2015 and is really taking off! I asked her what motivated her to start Simply Baked and what her favorite thing about running it is. She said, "I started the business because my doctor wanted me to supplement. Nash was slow to gain. I started making lactation cookies and they seemed to help me. I was pumping more ounces so I was hooked. I knew then that I had to make them healthier. So I did. I turned it into a business! I love to help moms that are down and out like I was... My breastfeeding journey was very tough and when moms write and thank me for my help it makes my day." 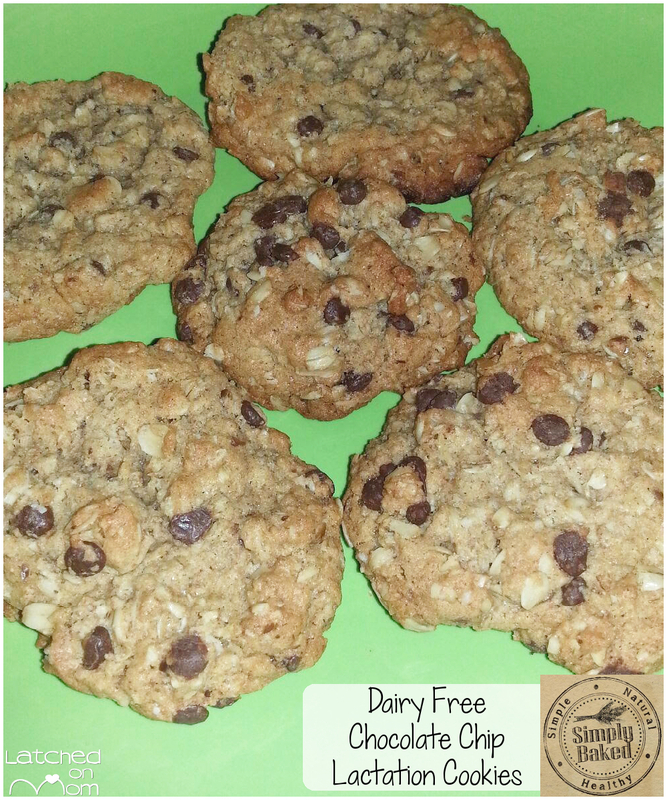 I was sent lactation cookies in exchange for a review. These cookies were sent with thoughtful carefulness. 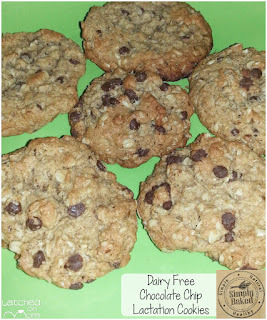 Above is a photo of a half dozen of premade Dairy Free Chocolate Chip Lactation Cookies. When you order this, you get a whole dozen cookies, which are paired into twos and wrapped in plastic wrap to keep them fresh. Then sealed in a cellophane bag and bubble wrapped. Nothing is going to get to those cookies except you! They are baked to perfection- golden and crispy on the outside but the middle is so soft and every bite just melts in your mouth. They are scrumptious! I'm dairy free because I have a sensitivity and my little one has shown all the signs of a sensitivity as well. 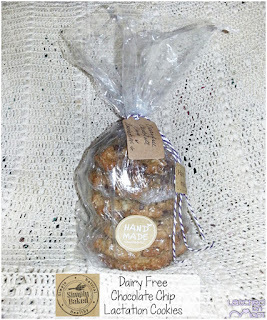 I love that Simply Baked Co. has dairy free options! Also, when you order a kit, you can customize the recipe yourself, which is a feature anyone would appreciate. I use cashew milk or almond milk and coconut oil in all of my recipes, so getting to make this recipe with familiar ingredients was great! 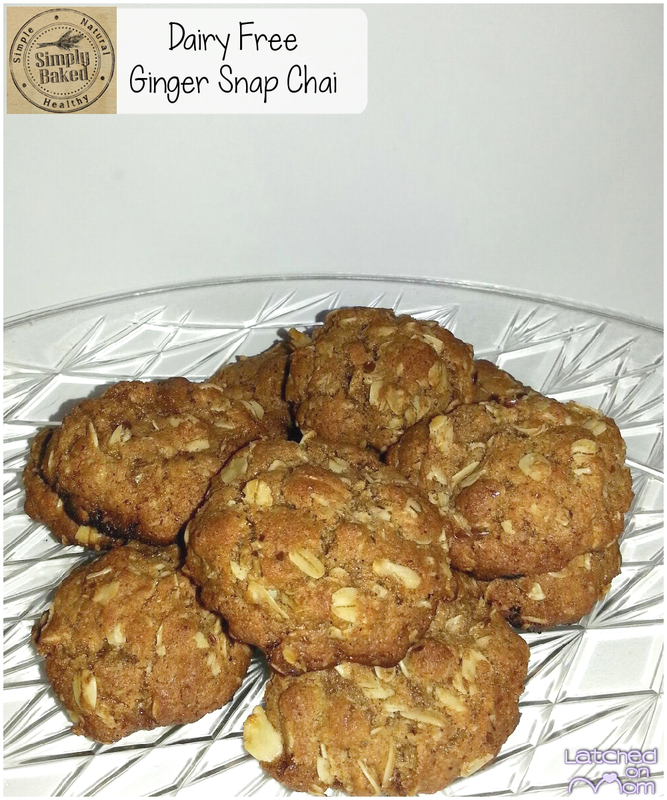 Pictured above is the soon-to-be released Ginger Snap Chai Lactation Cookies Kit. I was so excited to be one of the first to test this flavor! When I mixed it, the dough looked good enough to eat! I formed the dough into one inch balls, which is a little smaller than what you could make them, but I always figure it's best to start out slow. Plus, I like them poppable. It made about 2 dozen cookies. While the cookies were baking, my six year old said the house smelled like Christmas! She was so excited about that, she insisted on testing a cookie too! I have to say that I really enjoy the new flavor and I'm not even a fan of ginger snaps! The flavor is not as strong as you'd think because of the scent of the spices... It's actually very mild and such a delight! I think this new flavor is going to be a big hit! The majority of these cookies are dairy free. The ingredients that assist with lactation are Brewer's yeast, flaxseed and oatmeal. You can keep them frozen for up to 6 months and just pull one out whenever necessary. 2-3 cookies are recommended to eat at first, then just one every day thereon. Simply Baked Co says an increase should happen within 2-3 days of eating cookies. I only ate 2 the first day, and the next day I had a whole day of complete fullness! These cookies are absolutely worth trying if you need a boost! What's my favorite thing about Simply Baked Co? EVERYTHING! 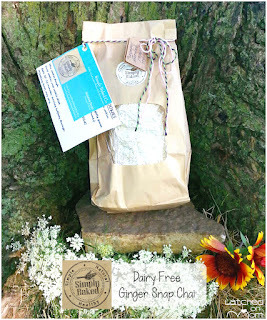 The packaging is spot on, the recipes are healthy, the flavors are delightful and the customer service is superb. Is there anything I'd change? I think everything this shop offers is way ahead of the curve, and if there's anything missing or anything you just have to have Kristen is glad to accomodate your needs. Simply Baked Co. is dedicated to giving their customers the best! I give Simply Baked a 10/10! SHOP Simply Baked Co. on Etsy- https://www.etsy.com/shop/SimplyBakedCo, LIKE Simply Baked Co. on Facebook and Follow on Instagram. Want to try these cookies? 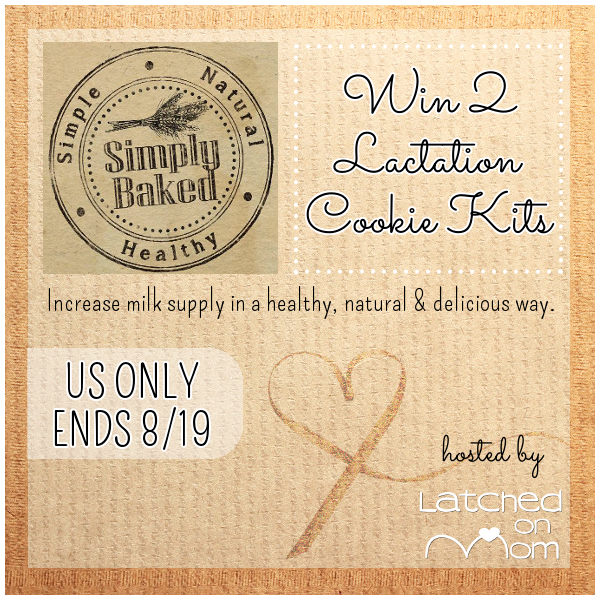 To help celebrate World Breastfeeding Week, Simply Baked Co. is giving away 1 lactation cookies kit of dairy free chocolate chocolate chip (double chocolate chip) and a lactation kit of Ginger Snap Chai. To enter, just fill out the competition form below! Open to US ONLY. Must be 18 years of age or older. Void where prohibited. Giveaway will run from 8/5/16-8/19/16. Winner will be announced on this post as well as emailed. You will have 48 hours to respond or another winner will be drawn. Amazing review! They look delicious! Sounds delicious! Great review! Thanks for the opportunity! Chocolate chip! I'm going back to work next week and I'm worried about supply while having to pump at work. :-( And I have never tried lactation cookies before! I haven't yet tried lactation cookies because my little one is just a week old, and I'm still recovering. A couple months ago I made some for my sister and have some of the crucial ingredients left. But winning a mix would be awesome, too. I would choose the chocolate chocolate chip. Thanks! 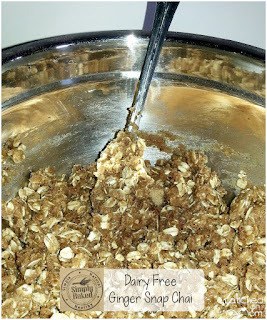 I have tried chocolate chip lactation cookies. If I won I would choose M&m oatmeal or chocolate chocolate chip!! Toya Reed --Ive never hurd of them before now but id love the m&m oatmeal or the cinnamon oatmeal both sound delicious! I never heard of this cookies but i would like to try them. They look so yummy! I have tried them! I like the chocolate chip kind. Oh yum they all sound yummy to me, especially chocolate chip or M&M oatmeal, but if I am lucky enough to win for our pregnant daughter who wants to breastfeed, I would let HER choose her favorite flavor. I would totally pick Chocolate Chocolate Chip if I won! My daughter abruptly stopped nursing 6 days ago (she's 9 months old) and during this nursing strike I am pumping but having a hard time keeping up with her demand. 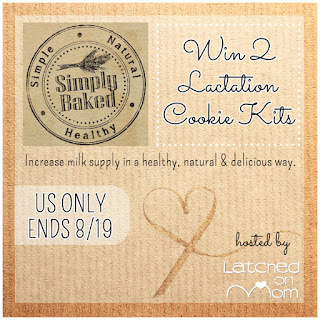 I think the lactation cookies would help! I haven't tried them before, but not this brand. They all sound absolutely amazing. I think I would be most excited to try the Cranberry Oatmeal flavor.